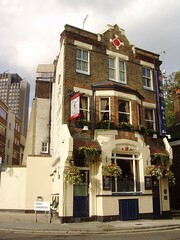 A Shepherd Neame pub just off Blackfriars Road, in Borough. Despite being an imposing building, inside this is a fairly small and cosy pub, with a few tables on a raised area at the back, and more down the front, the bar being in the middle. There's some seating outside in a small beer garden area as well. Service is friendly, and the clientele seem to be mostly regulars, so the atmosphere inside is jovial. It turns out to be an especially good respite from the coldness of winter, and on Ewan's Tuesday evening visit the place wasn't too busy, probably due to its slightly out-of-the-way location. There are a few handpulls, which in October 2008 had Spitfire (£3/pint) and Kent's Best, perfectly well-kept as you'd expect. As of April 2010 food is available noon-2pm Monday-Friday. There's a bookable function room upstairs which can seat 30. Last visited by Ewan, 28 October 2008. Opening Hours provided by a member of staff, April 2010. Food times taken from the Rose & Crown website, April 2010. Last edited 2013-05-10 07:56:56 (version 6; diff). List all versions. Page last edited 2013-05-10 07:56:56 (version 6).